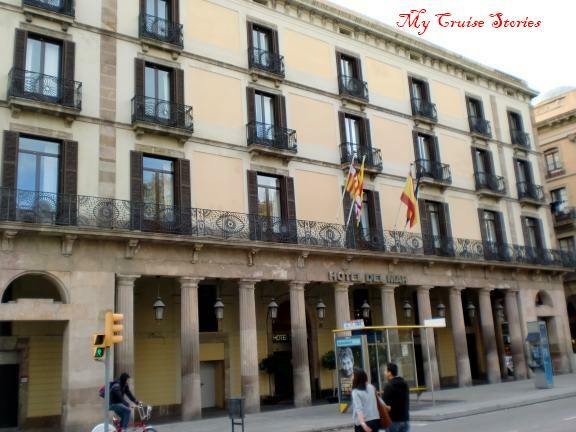 Our transatlantic cruise for the new Carnival Breeze’s maiden voyage to America began in Barcelona, Spain. 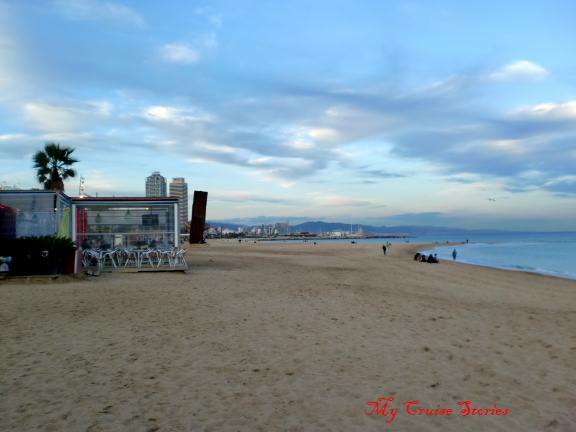 While we would have liked more time to explore the area, we had just one night in Barcelona. On our cab ride to the hotel we saw a where the graves had all been dug into solid rock on a nearly vertical surface. The tombs and crosses covering the entire face of the cliff sparkled in the sunshine. We flew into Spain via Germany on Lufthansa. Our first plane left early, our second plane left late. We had just a couple hours of daylight to walk around the area near the Hotel del Mar where we spent the night not far from the cruise ship docks. 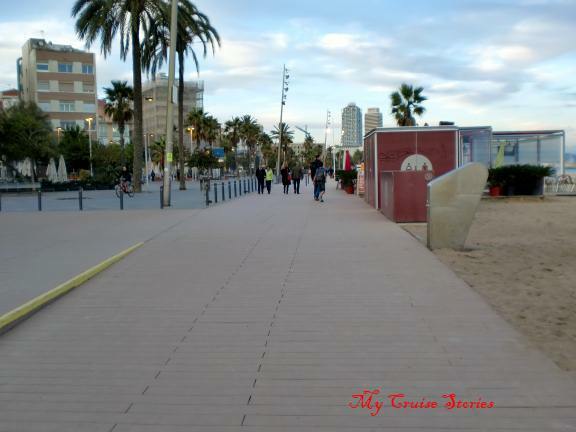 Walking toward the water, we saw a sign that said Barceloneta, which is the name of the neighborhood where we stayed. The area had all sorts of interesting transportation. 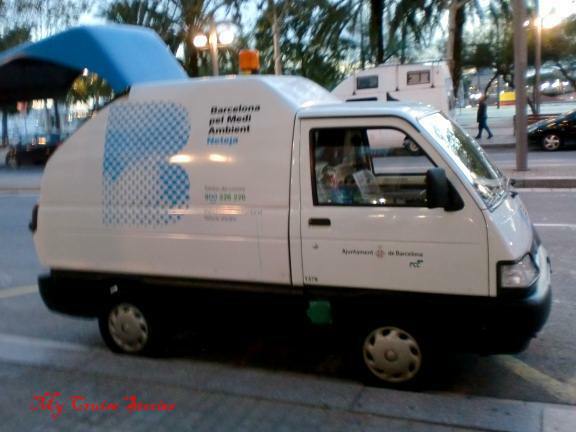 We saw one little mini-truck parked at the curb plugged into a solar charging station. Other little mini-trucks bustled around making deliveries. Many people had tiny cars as well, some only big enough to squeeze in 1or 2 people. Pedal power ruled with all sorts of crazy vehicles people could get rides in. We also saw places to rent bikes or scooters. Some of the policia (cops) even rode scooters. They probably need the tiny trucks and cars to fit down the very narrow streets in some areas. People just did not plan for modern vehicles when they built many of the area’s buildings centuries ago. If we had more time we could have taken a hop-on hop-off double decker bus tour around the city and seen a lot more, but we did not have enough time to complete the tour before they closed for the night. We could see a sky ride going and walked to it just to find it full for the day and about to close so we didn’t get to ride that either. Many little outdoor cafes lined the street, some with fancy silver set out at the tables and patrons dressed in nice clothes. Others sold burgers or ice cream and did not have customers dressed in their finery. 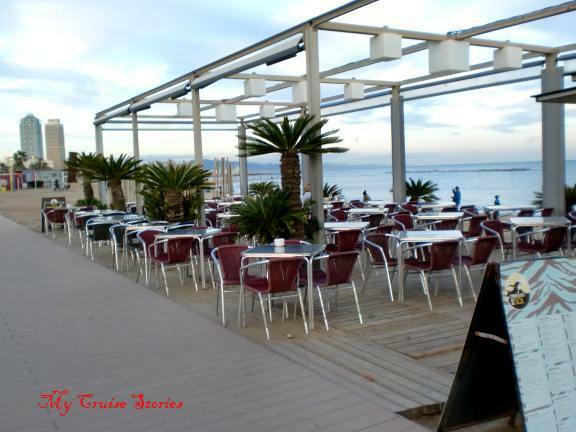 A boardwalk ran along the edge of the beautiful beach, with sidewalk cafes every hundred feet or so. A bike path also passed by the beach as well as along the road we had initially walked down on. 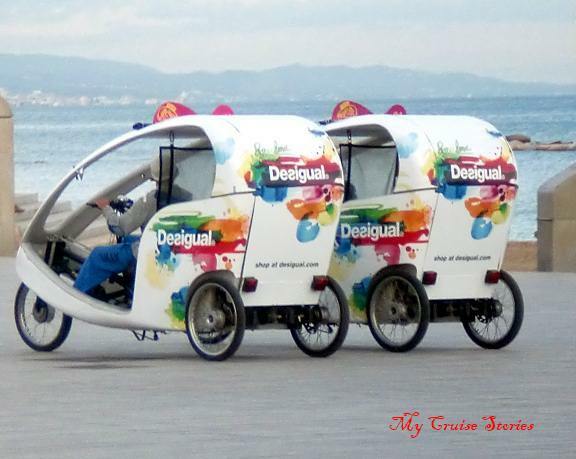 The beggers in Barcelona have gotten quite creative. 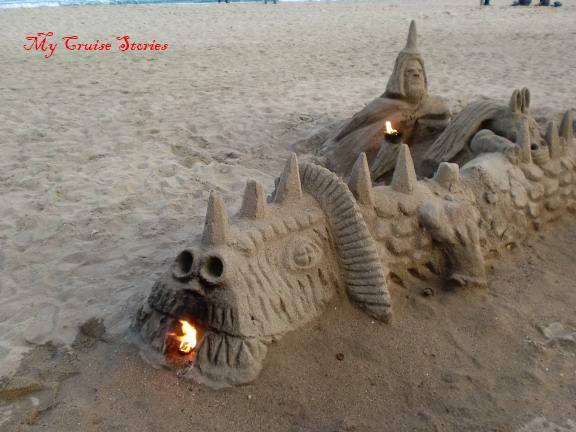 Although we did not make it to see any real castles, walking along the beach we saw all sorts of fancy sand castles, even a fire breathing dragon. Each of the sculptors had a box sitting beside the path for passers-by to throw coins in. The neighborhood we stayed in did have some old buildings with interesting architecture. We set out without our jackets in the sunshine. We hadn’t gone far before feeling a bit of a breeze as we neared the water. As the sun dropped lower in the sky the chill of night began to set in. Spain in November turned out not so warm as we expected. 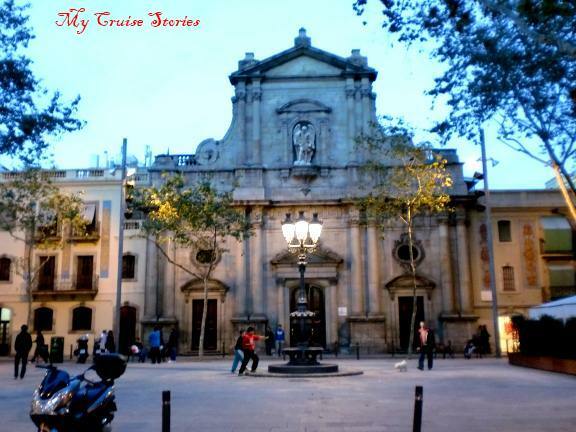 Barcelona’s history goes back centuries, with the area occupied over a couple hundred years BC. Various invaders over the eons brought in the influence of their own cultures, still seen in the architecture of the old buildings remaining today. Power of the ruling class came and went over time and periodically plagues, wars, or invaders decimated the economy and sometimes the population. Currently Barcelona is the second most populous city in Spain and the capitol of the Catalonia region. Three quarters of the Catalans and an eighth of the general population of Spain call the greater Barcelona region home. Barcelona has a lot of attractions. Its most famous landmarks include the Sargrada Familia church and the monastery at Montserrat. 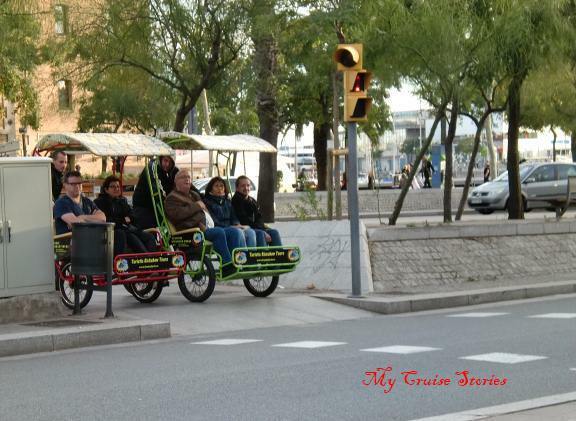 Some of Carnival’s tours in Barcelona include transfers to or from the ship for passengers boarding or disembarking there. 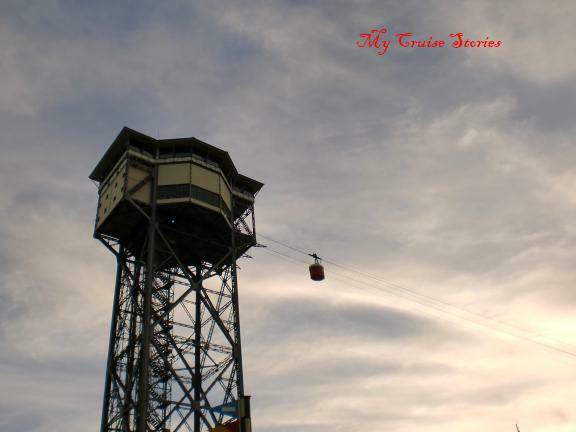 This entry was posted in Breeze, Carnival, Europe and tagged Barcelona, photos, Spain, transatlantic cruise, travel. Bookmark the permalink. I love seeing the tiny cars. They are just adorable!! 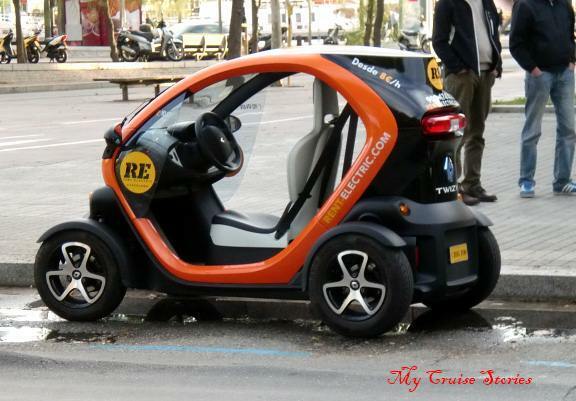 You know what they say in Europe, “Tiny cars equals tiny _______.” I’ll let everyone fill in the blank, but from what I could see I’d say “Tiny cars equal BIG tourists” as most of the tiny cars I saw had overly large touristy looking people driving them. The cars are cute though. I thought the tiny cars were the cutest thing too. And probably necessary for the narrow roads. Looks like Spain is efficent in building grave yards. 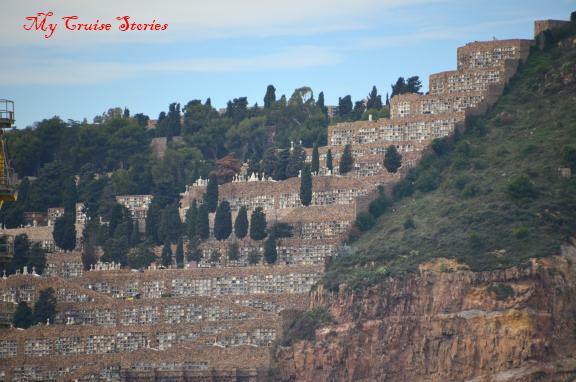 If each of the squares in the sides is a grave then they have them stacked four or five high per level. Takes a lot less space then having only one person per space. I haven’t been to Italy yet, but have a 2016 cruise booked that has several port stops there.